Traverse City is named after the Grand Traverse Bay, which the city heads. The bay earned its name from 18th-century French voyageurs who made la grande traverse, or "the long crossing", across the mouth of bay. On Old Mission peninsula, Rev Peter Doughtery started the first permanent settlement in 1839. In 1847, Captain Boardman of Naperville, Illinois, purchased the land at the mouth of the Boardman River at the head of the west arm of the bay. During that year the captain, his son, and their employees built a dwelling and sawmill near the mouth of the river. In 1851 the Boardmans sold the sawmill to Hannah, Lay & Co (Perry Hannah, Albert Tracy Lay and James Morgan), who improved the mill greatly. The increased investment in the mill attracted additional settlers to the new community. As of 1853, the only operating post office in the Grand Traverse Bay region was the one located at Old Mission, which was then known as "Grand Traverse". While in Washington, D.C. in 1852, Mr. Lay had succeeded in getting the U.S. Post Office to authorize a new post office at his newer settlement. As the newer settlement had become known as "Grand Traverse City", Lay proposed this name for its post office, but the Post Office Department clerk suggested dropping the "Grand" from the name, as to limit confusion between this new office and the one at nearby Old Mission. 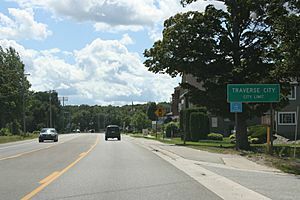 Mr. Lay agreed to the name "Traverse City" for the post office, and the village took on this name. In December 1872, rail service arrived in Traverse City via a Traverse City Rail Road Company spur from the Grand Rapids and Indiana Railroad line at Walton Junction. This opened up the area to settlement and industrial development. Its location near the 45th parallel is tempered by the strong and moderating effects of Lake Michigan and Grand Traverse Bay, which have a particularly noteworthy effect on the peninsulas that branch north of the city. As a result, they have viticulture and Cherry orchards. Consequently, it generally experiences warm, mild summers and severe winters. Lake Michigan especially, but also Grand Traverse Bay, greatly impact the area's diverse coastal weather patterns, which occasionally consist of sudden and/or large amounts of precipitation during the seasonally active periods. Lake-effect snowfall constitutes a large percentage of the total annual snow accumulation, which averages around 80 inches (203 cm). Periods of snowfall typically last from November to April, although light snow as late as May or as early as late September sometimes occur. Traverse City's record high temperature is 105 °F (41 °C), recorded in 1936, and its low temperature is −33 °F (−36 °C), recorded on February 17, 1979. Traverse City is a part of the greater Northern Michigan region. 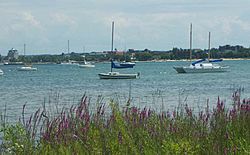 The city is the main inland port of the Grand Traverse Bay—a long, natural harbor separated from the waters of Lake Michigan by the Leelanau Peninsula, and divided longitudinally almost evenly by a narrow peninsula of tiered hillsides and farmland called Old Mission Peninsula. 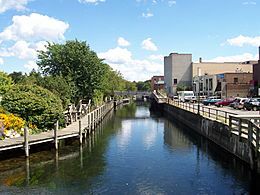 The most prominent of the city's waterways is the Boardman River. Along with Boardman Lake, the river is part of the Boardman River Watershed. The Boardman’s 287-square-mile (740 km2) watershed contributes one-third of the water volume to the bay and is one of Michigan’s top-ten fisheries, with more than 36 miles (58 km) of its 179 miles (288 km) designated as a Blue Ribbon trout fishery. It is also a state-designated "Natural River". According to the United States Census Bureau, the city has a total area of 8.66 square miles (22.43 km2), of which, 8.33 square miles (21.57 km2) of it is land and 0.33 square miles (0.85 km2) is water. As of the census of 2010, there were 14,674 people, 6,675 households, and 3,369 families residing in the city. The population density was 1,761.6 inhabitants per square mile (680.2/km2). There were 7,358 housing units at an average density of 883.3 per square mile (341.0/km2). The racial makeup of the city was 94.4% White, 0.7% African American, 1.8% Native American, 0.7% Asian, 0.5% from other races, and 1.9% from two or more races. Hispanic or Latino of any race were 1.9% of the population. As of the census of 2000, there were 14,532 people, 6,443 households, and 3,485 families residing in the city. The population density was 1,728.7 per square mile (667.2/km²). There were 6,842 housing units at an average density of 813.9 per square mile (314.1/km²). The racial makeup of the city was 96.00% White, 0.65% African American, 0.98% Native American, 0.50% Asian, 0.03% Pacific Islander, 0.48% from other races, and 1.36% from two or more races. Hispanic or Latino of any race were 1.67% of the population. There were 6,443 households out of which 24.5% had children under the age of 18 living with them, 39.7% were married couples living together, 11.2% had a female householder with no husband present, and 45.9% were non-families. 35.9% of all households were made up of individuals and 13.7% had someone living alone who was 65 years of age or older. The average household size was 2.15 and the average family size was 2.82. In the city, the population was spread out with 20.3% under the age of 18, 10.8% from 18 to 24, 29.6% from 25 to 44, 24.1% from 45 to 64, and 15.2% who were 65 years of age or older. The median age was 38 years. For every 100 females there were 90.5 males. For every 100 females age 18 and over, there were 87.2 males. The median income for a household in the city was $37,330, and the median income for a family was $46,912. Males had a median income of $31,587 versus $22,512 for females. The per capita income for the city was $22,247. About 4.8% of families and 8.4% of the population were below the poverty line, including 7.2% of those under age 18 and 7.9% of those age 65 or over. Most of Traverse City's economy is based on tourism. As part of the 2011 tourism advertising campaign the Traverse City Visitors Bureau, Traverse City Cherry Capital Airport and local businesses sponsored a video to be played on all Delta flights in the month of June 2011. The National Cherry Festival, usually in the first week of July, tends to host hundreds of thousands of tourists and locals to the area. It has become a focal point within the craft brewing trend. In November Beer Week is celebrated, with tours of breweries including samplings of craft brews, dinners and workshops. Traverse City has many nicknames. "T.C." Is used by many locals. "Up North" is used by people in southern and central Michigan. "Cherryland U.S.A." and "The Coast Guard City" are used by people out of state, and "Queen City" is used by many suburb-dwellers. The National Cherry Festival, held during the first full week of July every year, is a draw for tourists to Traverse City. The festival features parades, fireworks, an air show, election of festival royalty, live music, a pie-eating contest and cherries. It is estimated that the Grand Traverse region produces up to 360,000,000 pounds (163,000,000 kg) of cherries annually. The largest variety of cherry produced locally is the Montmorency cherry, or the "pie cherry". Other cherries grown in the region include the Ulster, or sweet cherry, and the Balaton (from Lake Balaton in Hungary), a cherry situated between the Montmorency and Ulster in terms of color and taste. The locale and topography is conducive for road bicycling, aided by the TART trail system. A map with routes, different trips, advice and local knowledge is available. Lake Michigan presents a location for sailing, fishing, and kayaking. The Traverse City State Park, with about 250 campsites, is located three miles (4.8 km) east of downtown on 47 acres (19 ha) including a quarter mile beach on the East Bay arm of Grand Traverse Bay. The Boardman River Nature Center is the interpretive center and management headquarters for the Grand Traverse Natural Education Reserve, a 505-acre local park and natural area. The sandy soil is conducive to viticulture, and there are over 50 wineries in the Traverse City area. Most offer free wine tasting. Traverse city is located at the base of the Old Mission Peninsula wine region. Traverse City's central business district is located along Front Street downtown. Another major shopping district is on US 31 southwest of town, where several big box stores are located, as well as a shopping malls, the Grand Traverse Mall, anchored by Target, JCPenney, Macy's. Previously, the highway corridor also housed the Traverse City Premium Outlets. Another mall, Cherryland Center, is located on Garfield Avenue on the south end of town; this mall features Kmart, Younkers, and Sears. Traverse City is home to a professional baseball team and a semi-professional football team. The Traverse City Beach Bums are a member of the independent Frontier League and play their home games at Wuerfel Park in nearby Blair Township. Their inaugural season in Traverse City was 2006. Starting in 2005 Traverse City was host to the Traverse City North Stars a Junior "A" level hockey club (member of the North American Hockey League); they played at the Centre I.C.E. hockey arena. At the end of the 2011–12 season it was announced the North Stars would fold and be replaced in the NAHL by the Soo Eagles. Shortly thereafter the former owner of the North Stars, Chad Fournier, announced he would be bringing a new junior hockey team to Traverse City. The Traverse City Cohos began play in the Midwest Junior Hockey League in September 2012. Traverse City also hosts the training camp for the Detroit Red Wings NHL hockey team as well as the Traverse City Prospects Tournament, an annual tournament displaying young NHL prospects from select NHL teams. The Traverse City Wolves are a semi-professional football team who played their home games at Thirlby Field. Their inaugural season was 2009. The Wolves are a member of the North American Football League, in the Great Lakes region of the Northern Conference. The City Opera House, located in downtown Traverse City features plays, movies, and other performances. The Traverse Symphony Orchestra (TSO), founded in 1952 by community leader Elnora Milliken as the Northwestern Michigan Symphony Orchestra, has grown from a small group of volunteer musicians to a paid professional orchestra of 60 contracted members. There was a connection over the years with Interlochen Center for the Arts, providing a core of musicians and conductors from among faculty and students. Until 1985 it was known as the Northwestern Michigan Symphony Orchestra. The Dennos Museum Center, located on the campus of Northwestern Michigan College, is home to a collection of Inuit art including sculpture, drawing and prints. The center is also home to a children’s museum, as well as various ongoing exhibitions in their large exhibition space. Traverse City was named by USA Today among the Top Ten Places for Local Wine. There are seven wineries on the Old Mission Peninsula and 21 wineries on the Leelanau Peninsula, both just a few minutes drive from downtown Traverse City. Both peninsulas sit close to the 45th parallel, a latitude known for growing prestigious grapes. The two arms of Grand Traverse Bay provide the ideal maritime climate and the rich glacial soil does the rest. 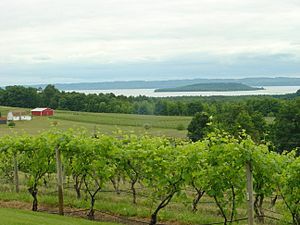 Northern Michigan specializes in growing white grapes and is known for its Rieslings which grow well in the summer months and late fall which Traverse City is known for. Every October the wineries host a harvest fest. Some Riesling grapes are spared being picked in the fall to be picked when they freeze, from which ice wine is made. The wineries along the Old Mission Peninsula are Black Star Farms, 2 Lads Winery, Bowers Harbor Vineyards, Brys Estate Vineyard & Winery, Chateau Chantal Winery And Inn, Chateau Grand Traverse, and Peninsula Cellars. The wineries along the Leelanau Peninsula are Black Star Farms, Leelenau Cellars, Silver Leaf Vineyard and Winery, Gill's Pier Vineyard and Winery, Raftshol Vineyards, Circa Estate Winery, Forty-Five North Vineyard and Winery, Good Harbor Vineyards, Chateau Fontaine, Boskydel Vineyards, L. Mawby Vineyards, Ciccone Vineyard and Winery, Willow Vineyards, Chateau de Leelanau Vineyard and Winery, Shady Lane Cellars, Cherry Republic Winery, Longview Winery, Boathouse Winery, Verterra, Brengman Brothers, and Bel Lago Winery. With a new terminal completed in 2004, Cherry Capital Airport provides regularly scheduled passenger airline service to Chicago, Detroit, Minneapolis and seasonally to New York, Cleveland, Atlanta and Denver as well as to smaller Michigan destinations to the north. Adjacent to the airport is Coast Guard Air Station Traverse City, responsible for both maritime and land-based search and rescue operations in the northern Great Lakes region. On April 7, 2010, the USCG designated Traverse City a Coast Guard City. Traverse City is the second city in Michigan and tenth in the country to receive this honor. Located in the harbor of the Great Lakes Maritime Academy is the T/S State of Michigan, a 224-foot (68 m) former Navy submarine surveillance vessel. The vessel is used as a classroom and laboratory while cadets of the Academy are underway and shore side. A tall ship, the schooner Manitou is berthed at Traverse City, and offers passages to the public. Near Traverse City are two other tall ships, the schooner Madeline and the 55-foot (17 m) long replica of the sloop Welcome, an 18th-century British warship sloop, which was built for the 1976 Bicentennial of the American Revolution. They are the only two boats recognized by the State of Michigan for their historic significance. From May through October, trained volunteers conduct tours (when in port), and give a history of the boats and Great Lakes sailing. The Madeline is berthed at Elmwood Township "Coal Dock" (Heritage Harbor) - West Bayshore, just south of the Elmwood Township Marina Both are maintained by the Maritime Heritage Alliance. The Nauti-Cat, a 43-passenger catamaran books passages on Grand Traverse bay. The Nauti-Cat is the largest commercial sailing catamaran on the Great Lakes at 47-foot (14 m) long, 29-foot (8.8 m) wide and has a 63-foot (19 m) mast. They offer cruises 7 days a week, 4 times a day. The area is served by Indian Trails Bus service and which is an intercity bus system that connects to St.Ignace to the north. Also connects to Grand Rapids and Kalamazoo to the south. The bus station is located at 107 Hall Street with connection to the BATA transfer station. Traverse City also has a public transportation system, the Bay Area Transportation Authority (BATA) which serves most of the Grand Traverse and Leelanau region. With link services and a fixed route bus service, called the Loops, serves Traverse City and the urbanized areas of Garfield Township. BATA put into service its first hybrid bus in December 2005. BATA's downtown bus transfer terminal on Hall Street opened July 21, 2006. The terminal is used to transfer riders to different buses on different routes. US 31 connects northward from Traverse City to Petoskey and the Mackinaw City area. It also continues south and westerly from the city to Ludington, Muskegon and other points along the Lake Michigan shoreline. M-22 follows the Lake Michigan shoreline around the Leelanau Peninsula, providing a scenic drive. M-37 runs almost due south through the Manistee National Forest to Grand Rapids. The highway also continues north up Old Mission Peninsula to end at Old Mission Point in the middle of Grand Traverse Bay. M-72 passes east–west through the city, connecting west to Empire in the Sleeping Bear Dunes National Lakeshore on Lake Michigan and east through Kalkaska and Grayling to Harrisville on Lake Huron. The Great Lakes Central Railroad (GLCR) provides freight rail service to the Traverse City area on track owned by the state of Michigan. The tracks were once owned by the Chesapeake and Ohio Railway (ex-Pere Marquette Railway) and the Pennsylvania Railroad (ex-Grand Rapids and Indiana Railroad) but were purchased by the state in the late 1970s and early 1980s to preserve rail service in the area. Current freight traffic includes fruit/perishables, scrap metal, and lumber. Regular intercity passenger train service ended on October 29, 1966, after the Chesapeake and Ohio Railway (C&O) discontinued Grand Rapids–Traverse City–Bay View service. Since then, excursion passengers trains have operated in and out of Traverse City on an irregular basis. Recently, Lake Central Rail Tours has operated a summer excursion during the Cherry Festival until 2008. On May 11, 1996, the Grand Traverse Dinner Train began year round service from the Traverse City depot to Williamsburg and to Walton Junction. Dinner train service was suspended in 2004 after a contract dispute with the Tuscola and Saginaw Bay Railway and additional difficulties. The train itself was removed to Owosso in mid-July 2006. However, in 2015 a study was started by the Michigan Department of Transportation, and passenger rail is gaining interest. The Boardman Neighborhood Is the second smallest neighborhood in Traverse City. It is east of State Street, south of Front Street, north of Webster Street, and west of Railroad Avenue. Captain Boardman of Illinois lived in this neighborhood, as well as the Hulls and Havilands. The Central Neighborhood is in southwestern Traverse City, despite its name. It was named when Traverse City was smaller, as this was the Center. The Historic Perry Hannah House is in this neighborhood, as well as the Central Grade School, the largest elementary school in TCAPS. The Traverse Heights Neighborhood is in southeastern Traverse City. As the fourth largest neighborhood in Traverse City, it stretches from Boardman Lake to Garfield Avenue. It is known for its railroads and the Woodmere Library. The Downtown District (or Central Business District) is right along the bay. Its main streets are State, Front, and Grandview Parkway. It is known for shopping and businesses, as well as restaurants. The famous City Opera House is downtown, too. Many other historic buildings exist here, too. Slabtown is the former name for Traverse City. The main downtown area used to exist along Second Street here. It is the largest neighborhood. It has Wayne Hill and the Hickory Hills Ski Area. Part of it is known as Old Towne. The Grand Traverse Commons are probably the most historic neighborhood in Traverse City. 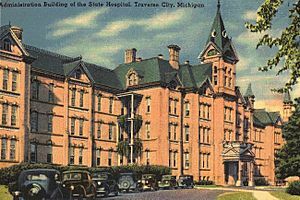 The Traverse City Asylum Is here, though it is now repurposed as a small shopping center. Many hiking trails, shops, restaurants, and schools are in the area. 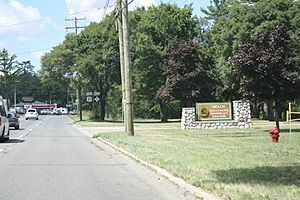 The Oak Park Neighborhood was formed from parts of Traverse Heights and Oakwood Neighborhoods. It is the third smallest neighborhood. The Oak Park School is the largest building here. The Oakwood Neighborhood is the easternmost neighborhood in the city. It is named after the Oakwood Cemetery, the largest cemetery in Traverse City. The Traverse City Civic Center is in the northwestern part of this neighborhood. The Airport Neighborhood was originally part of Traverse Heights. It sits along the Cherry Capital Airport Runways on Garfield, Boon, Hastings, Parsons, and South Airport Roads. These neighborhoods consist of small one floor houses. The Cherry Capital Airport Terminal sits in the eastern part of this neighborhood. The Warehouse District is the smallest District in Traverse City. It mostly exists along Hall, Garland, Gillis, and Front Streets. It uses many repurposed buildings as restaurants and shops. One of the two BATA Bus Garages sits along Hall Street. Many banks also sit along Gillis Street. Traverse City is part of the Roman Catholic Diocese of Gaylord. The sister city of Traverse City is Tsuchiyama, Shiga, Japan. 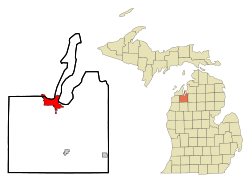 Traverse City, Michigan Facts for Kids. Kiddle Encyclopedia.